Da me dau phong is a very popular drink in Vietnam it seems. I can only imagine because I’d never been to Vietnam myself. But I’d heard loads from other folks, especially a dear friend of mine, Syebvonne Nguyen whom I’d gotten to know only over the last 2 years or so but it feels almost like I’d known her for a long time! She has such a spontaneous and likable personality which makes her so easy to befriend. Despite being a mother of five, she is still very fond of doing crazy things, going crazy places at crazy times, and even makes one do it with her! But she is super fun to hang out with, always full of cheer and energy. Alas her family would be leaving us for UK very soon. Oh how we wouid all miss her dearly… her silly jokes, her infectious laughter and of course, her enduring friendship. But I wish her and her family the very best, and with the advances in technology, the world’s gotten a lot smaller than we thought, so I’m very sure and we would all meet up again in no time! I’d ordered a glass of Da Me Dau Phong earlier this year with a friend Lynette when we dined at a Vietnamese restaurant in Joo Chiat called Luong Phuong. It is a casual dining family restaurant which probably serves one of the best Vietnamese food in Singapore. Then we reprised it again over a luncheon at the same place with Syebvonne, Lena, Anna and Soo Keong. As a group, we were able to sample so many dishes together, amidst all that chitter chatter. Good food with great company, one really couldn’t ask for much more in life. And now with a good tub of homemade sugared tamarind paste in my fridge, I could enjoy a glass of Da Me Dau Phong now anytime! All that’s left is for me learn how to make a wickedly good pho!! 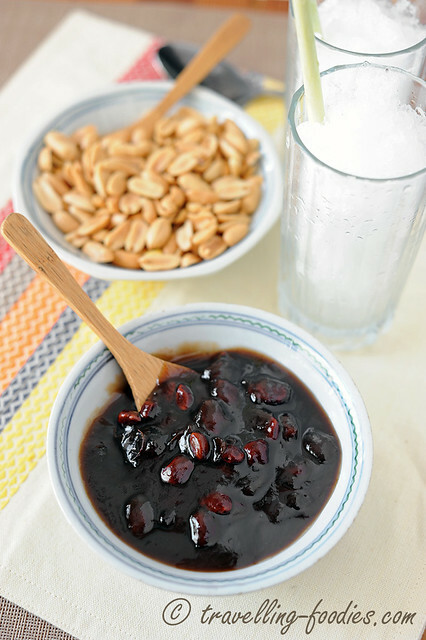 Using fork or clean fingers, break up the tamarind pulp and rub it into the water to form a slurry. Place the saucepot over medium-high heat and bring to a boil. Return to a boil and bring heat down to low. Simmer for 10 min or so to thicken the paste. Take the pot off the heat and leave it to cool down to room temperature. 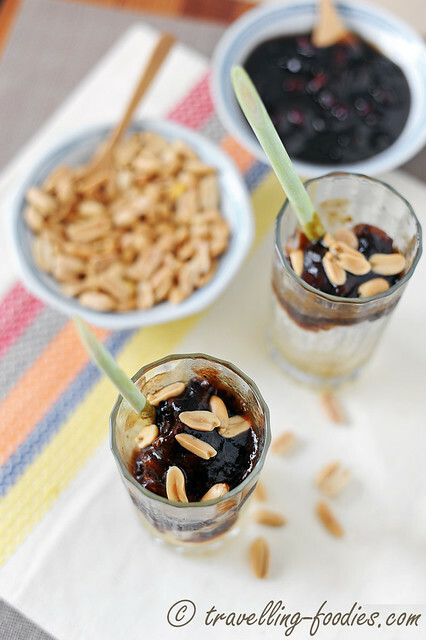 Pour sugared tamarind paste into a clean jar and storage in refrigerator. 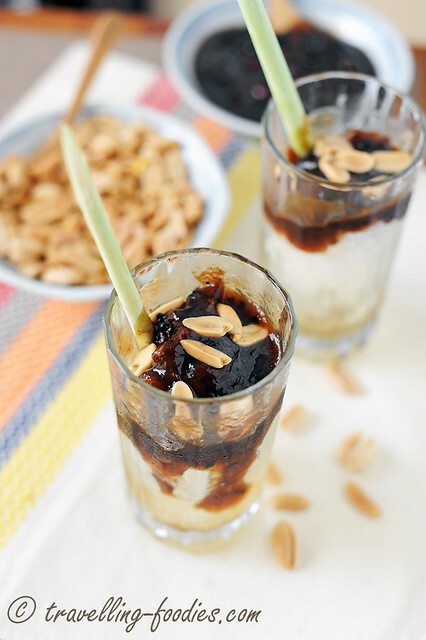 To enjoy, Add 2 tbsp of sugared tamarind paste over a glass of crushed ice. Add a small handful of roasted peanuts and top up with a small amount of cold water. Stir well to homogenise the mixture and enjoy! *** traditionally, regulated granulated sugar is used but I’d made it with Thai palm sugar and I think I like it better with it! Feel free to stick to granulated sugar though. Also, I would imagine it to taste fabulous with chilled soda in place of cold water for all that fizz! Perfect for the scorching hot weather we have now in the mid of June! This entry was posted on June 24, 2014 by Alan (travellingfoodies). It was filed under Food, Simple Eats and was tagged with asam, assam, da me dau phong, da me lac, nuoc da me, roasted peanuts, tamarind, Vietnam, Vietnamese Iced Tamarind and Roasted Peanuts. I am glad to have stumbled into your site here; you have some great variety of things that I could learn from. This one in particular looks amazing since I love love love peanuts! Thanks for sharing these! hi Derek! thanks for dropping by and commenting! yeah I love the crunch from the peanuts as well! This is real fab for a hot summer day like what we are having now over here in Singapore. Where are you from? Despite staying in hanoi fpr three whole weeks and visited viet twice, i hv never had a chance to sample this drink. Strange coz back then i wasn’t that interested in viet food except pho until my daughter came along. This event def brought me out from my comfort and to learn more so that i can impart this food culture to ky girl. Yeah totally agree with you, Malaysia Food Fest and now Asian Food Fest really enabled me to explore different cuisines which I don’t think I would have on my own! 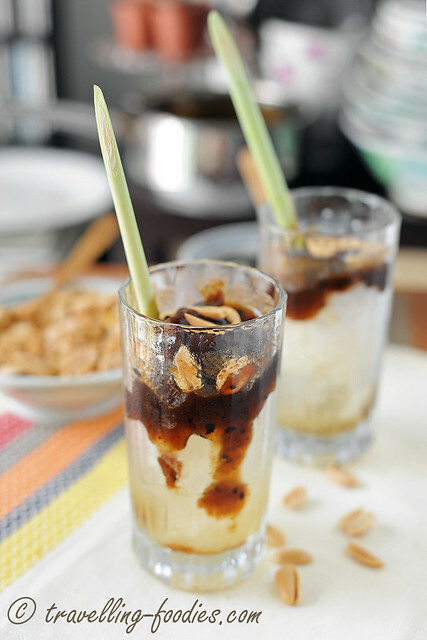 The Iced Tamarind looks good and refreshing! Perfect for summer. Yeah John! This is a life saver over here now to battle the heat of summer! I am originally from Seattle, how about you?